November 2014—When Cora Roelofs was looking for a house to buy, she specifically sought out a property that had most of its older windows still in place. “I wanted an old house with good bones that hadn’t been renovated since the 1970s,” she said, since she couldn’t have torn out someone’s renovation even if it didn’t appeal to her. She found a house in the Egleston Square area that was built in the late nineteenth century (she found it on an 1895 map) that she calls Hardway House in line with a family tradition. Although a few of the windows had been replaced, she still has twenty-one of the originals—and has been working with Boston Building Resources to get them back into shape. Cora took BBR’s Window Rehab workshop and has partially restored a number of windows already. “One lesson I have learned is that it’s a process,” she said. “If I don’t have time to do a complete renovation of each window, I can go back later and finish the remaining steps.” She plans to install storm windows as one of numerous measures to increase her home’s energy efficiency. But window repair isn’t the only aspect of BBR that Cora has been utilizing. She has also made quite a few purchases from the Reuse Center, including doors, tile, shelves, a rug, door hardware, light fixtures, and a variety of other things. She has also found materials on Craigslist and through other area sources for used goods, as well as reusing materials from the house itself. Importantly, she worked with a contractor who was enthusiastic about using salvaged materials, including many that he sourced himself from other jobs. Still, Cora found it difficult to watch the dumpsters fill with parts of the house that needed to go, such as the grease-soaked carpet from the kitchen. Window restoration has been an ongoing project for Cora. 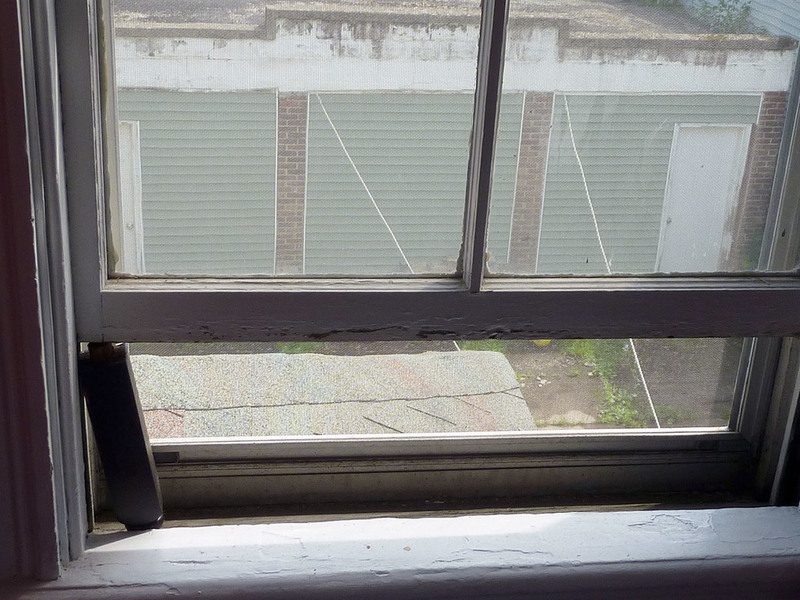 This window, propped open, remains to be done. 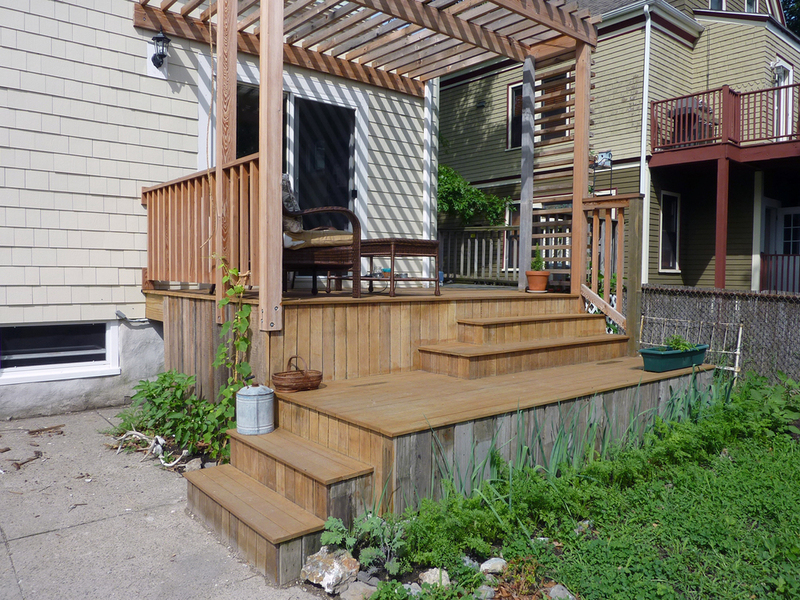 Cora's back deck is made of reclaimed lumber. These doors are among her Reuse Center purchases . 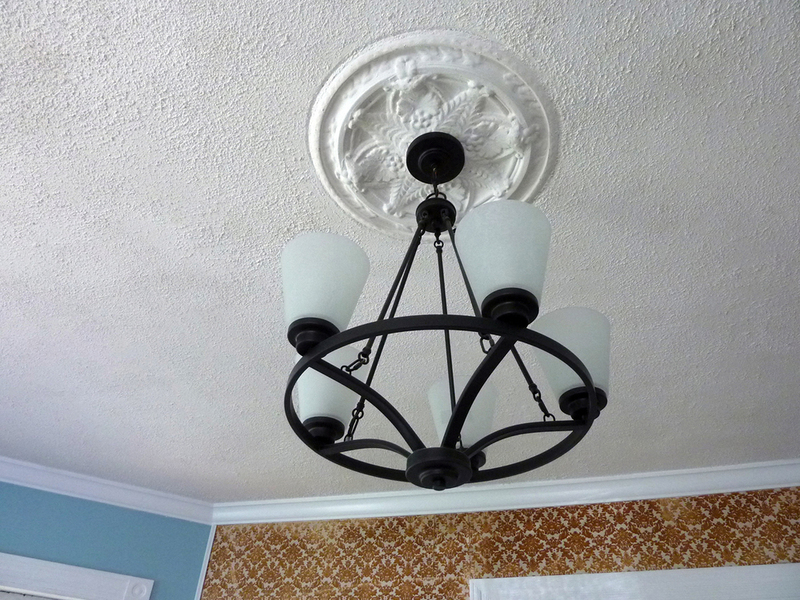 . .
...as is this light fixture. 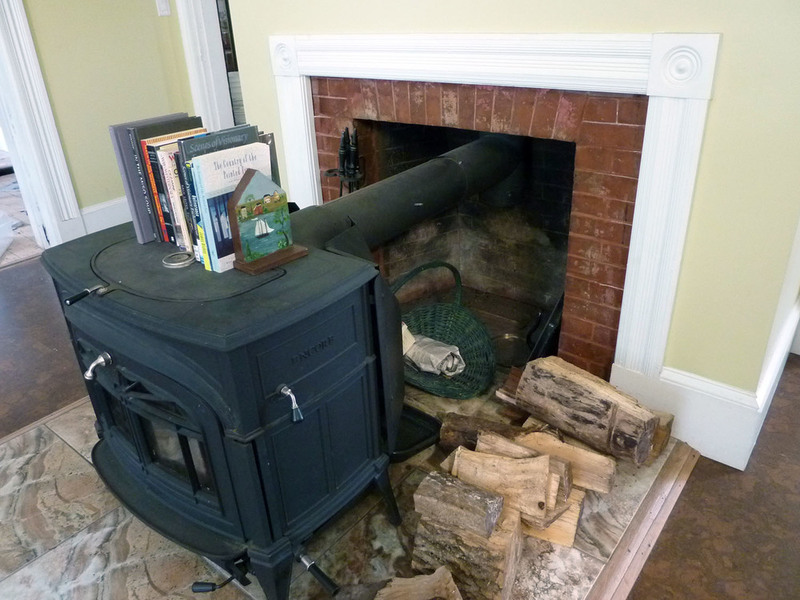 Casing from the house was reused to trim around the fireplace. Cora mixed paint to match the blue in this window. 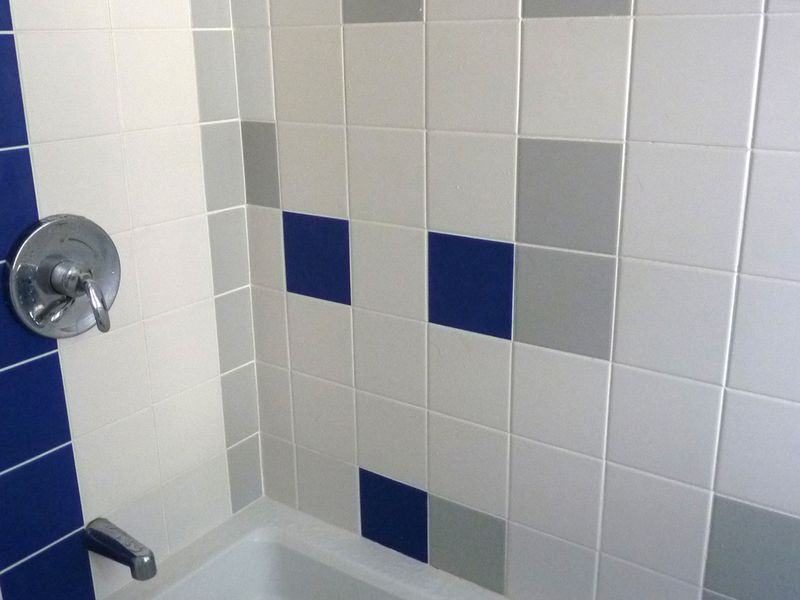 Tiles were found at the Reuse Center. This old kitchen cabinet has become a workbench. “I teach community health at Tufts, and many of the issues I study touch upon the question, ‘How should we live?’” she said. She is making her home a laboratory of sustainability and has been documenting the process on the Hardway House blog, with “using what you have” as a guiding principle. Out back, she worked with an architect and her contractor to build a pergola for “urban permaculture” to provide shade and fruit, with grapevines and hardy kiwis just starting to climb up the sides. The porch and pergola illustrate the “salvage chic” aesthetic with reused lumber from an unneeded wheelchair ramp, flooring salvaged from the kitchen, contractor-sourced discarded mahogany decking, antique heart pine from New England mills, and western red cedar from the Watertown Boys and Girls Club via Longleaf Lumber, the salvage lumberyard in Cambridge. “I was adamant that virgin resources, especially trees, were going to be used as little as possible,” she said. 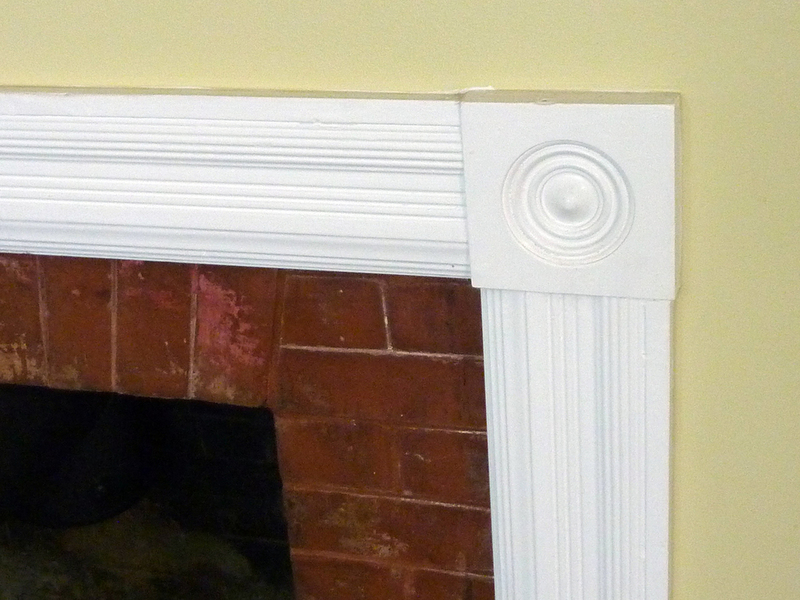 In the sitting room, belly casing and rosettes from elsewhere in the house were reused to trim around the fireplace. When painting the living room, Cora hand-mixed paint she had on hand in a variety of shades to come up with a blue that matches the room’s stained-glass window. The kitchen, which had to be completely demolished and rebuilt, was outfitted with secondhand materials from a variety of sources: kitchen cabinets, soapstone counters, a range hood, cooktop, and double oven. A real coup was the discovery of six boxes of cork flooring in a local thrift store at $20 per box. “The priority was to reuse whenever possible out of environment principles, but I also couldn’t have afforded what I liked ‘new,’” she said. As with many renovation projects, a lot has been done, but there is still plenty more to go—including the completion of the window restoration work. What’s in store for the future? She has a contract for photovoltaic panels and is considering proposals for solar hot water. She’d also like to sit on the porch and enjoy some grapes and kiwis! Need a refresher on window rehab? Take a look at BBR's four-part video series.